It all started last year. We wanted a headboard. But we had a dream design in our head and didn't want to/couldn't afford to buy one, poor married college students that we are. Plus we wanted it to be all ours. We didn't want anyone one else to have the headboard we had. So we crafted a master plan. It became - Operation: Make a headboard. And so we did. And while we were at, we made one for my parents, too. Luckily, we have a friend at church who just so happens to be in business (hobby) of cutting down really sweet trees (that are dying or bug infested, and the city want to remove anyway) like walnut trees and using super intense equipment to transform said tree into beautiful pieces of furniture. So naturally, being the intelligent people we are, we enlisted his help. Together, we transformed part of a tree (plus some foam padding, batting, and fabric) into this here beauty. 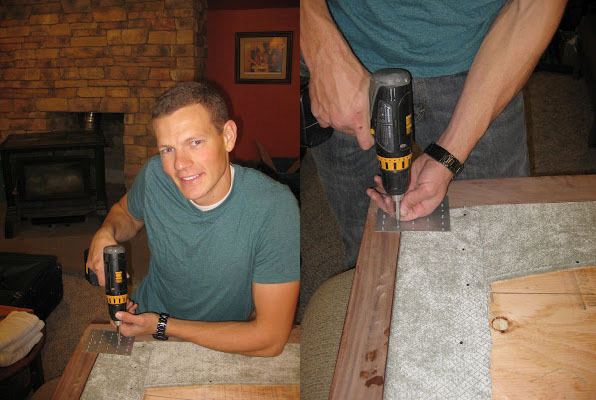 I'll give you the run down best I can, but for wood working, you need the right equipment and skills. If that's you - great! If not, enlist some help or just make an uphosltered headboard without the wood trim. I'll just give instructions on how we did the main part, not the wood frame. The frame took waaaaay the longest time, with tons of drawing, shaping, planing, oiling and more. The rest of the project is quick. First you need to determine how big you want it. We have a king size bed and wanted the headboard pretty tall, so we made a really big one, but I actually don't remember the exact dimensions. Then you need to pick out wood at your local home improvement store. What kind isn't super important. 1/2 inch thick is pretty good but you can do 3/4 as well. Cut it to your dimensions including any curves, etc. 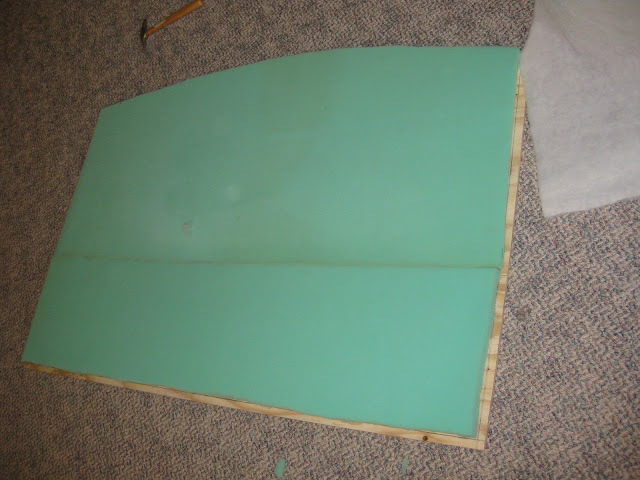 Then use spray adhesive and attach foam. We cut the foam 1/2 inch smaller on each side then the wood. We just got foam from Joann Fabric. You may have to piece the foam to make it fit. We did. Then lay a lighter weight flat quilting type padding over the foam, so give it a softer feel over the foam. 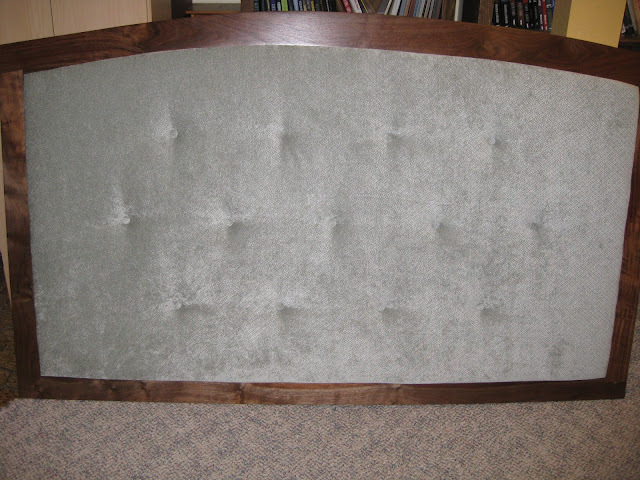 Then on the back of the headboard, the part that will be against the wall, measure and draw out where you want any tufts. You don't have to tuft it, but we wanted too. Drill two holes close together wherever your tufts will be because you'll have to wind wire through them. Then cover it all in your fabric! This part is so satisfying because it really looks like a headboard now. We used upholstery tags and a upholstery hammer to attach our fabric but you can also use a staple gun. We also some brace piece to attach our headboard to the frame, if your aren't framing it you don't need to do that. Then its time to tuft. Buy a covered button set and follow the directions on the package. Its super easy. You will need something sharp to pierce your upholstery fabric in the spots where your tufts go. Once the tufting is done - viola! You've got a headboard. We went on to add straps to the back of ours (to make moving easier) and we ended up attaching a wood leg to each side so it could stand up behind our bed. For our parents headboard that wasn't necessary, they mounted it to the wall. As 22 and 23 year old renters for the foreseeable future, we want an easy way to move ours around so this worked for us. Luckily my husband is a stud and takes on projects like this with me. So fun to see you two working together! Kelly is much like his dad in that respect, he likes to create things (and complete my projects some times!) Now you have an heirloom to pass on through the generations! !